While not the first comic book character, Superman is unequivocally the father of and quintessential embodiment of the superhero. The innovation of writer Jerry Siegel and illustrator Joe Shuster published in Action Comics #1 in 1938, fewer figures of fiction have had an impact on an industry and medium of entertainment as the Last Son of Krypton. Given his 80 years of uninterrupted existence, with his debut comic passing the momentous 1000th issue just last April, there have been numerous variations, translations, and interpretations both in an out of the comics. I myself have been tremendously influenced by Superman and his mythos ever since the classic Richard Donner movies starring Christopher Reeves. And while I admit Superman is my all-time favorite superhero, he is not the best superhero of all times, for all generations and walks of life. Coming off the heels of the critically acclaimed and successful animated movie Spider-man: Into The Spider-Verse, which stars African-Latino Miles Morales, created by the acclaimed scribe Brian Michael Bendis and Sara Pichelli (voiced by Shameik Moore in the film), this animated masterpiece gave mainstream movie-going audiences a new interpretation of another classic and iconic superhero. To my knowledge this has been the first “Black” Spider-man in history (subject to correction), a brand-new character who has actually existed since 2011 (Ultimate Fallout #4). I knew of Miles since his debut prior the movie and have been following his growth ever since, and am elated with the success this movie has accumulated and what it means for Nubian superhero representation in movies (and other media) post-Black Panther. With Miles Morales is a worthy successor in his own right, with his own rabid following and media growth, it made me look back to the first superhero himself and what versions and/or interpretations there have been of a Nubian flavor. To my surprise, there have been quite a few genuine “Black” Supermen. I’m not speaking of homages like Milestone’s Icon or Marvel’s Blue Marvel, but actual characters bearing either the name of or the iconic alien “S” glyph of the Man of Tomorrow. Their individual uniqueness varied from the subtle to the extreme, giving a nice wide perspective to view each and every one of them. Of course, some were more fleshed out that others – none garnishing real permanence – and the most recent actually debuting the same year as Miles. Nevertheless, I felt it needed to look back, explore and bring to the light what potential (or missteps) lied forgotten in the annals of DC’s long history. Sunshine Superman. Image credit DC Comics. 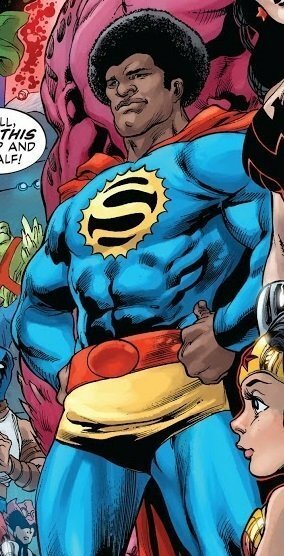 The least flattering and first Nubian last son of Krypton is “Sunshine Superman” (created by Grant Morrison & Chaz Truog), an Afro-headed 60s/70s influenced version of our indomitable hero inspired by the (unrelated) song of the same name by singer Donovan in 1966. His scant existence was thankfully merely a cameo role. He has only really made two appearances since his arrival in Animal Man #23 (1990), as a resurrected casualty of the multi-reality destroying event of Crisis of Infinite Earths (1984-1985) alongside his groove cohorts of the “Love Syndicate of Dreamworld”, Speed Freak and Magic Lantern – versions of the Flash and Green Lantern respectively of Earth 47. It may come as a blessing that little of Sunshine Superman was explained or explored since his debut, and it may be for the best that nothing has been seen or done with this version of Superman since. On a trivial side note, there was also a purely unrelated documentary film bearing the same title as “Sunshine Superman” in 2014. Calvin Ellis/ Kalel, Superman of Earth 23. Image credit DC Comics. 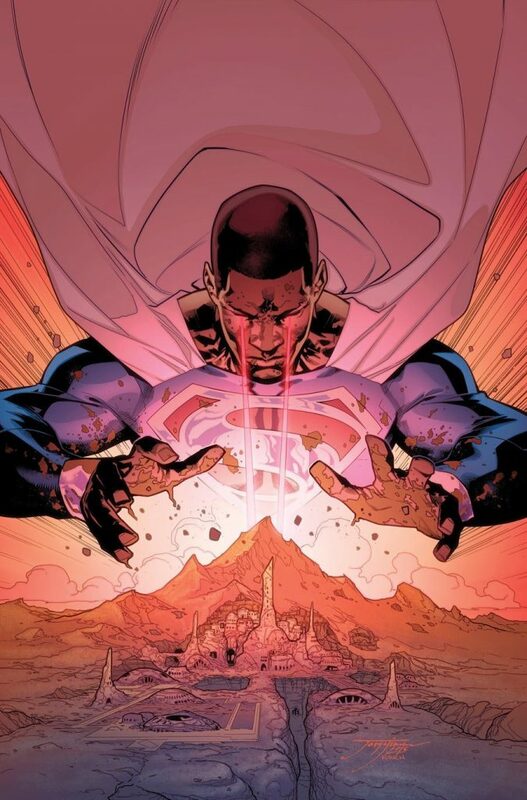 A much more respectful version of a Black Superman, also birthed from the concept of a “multiverse”, is Calvin Ellis/Kalel, Superman of Earth 23. Another product of famous author Grant Morrison, as well as Doug Mahnke, this Nubian Kryptonian is virtually identical to that of the mainstream and original namesake. 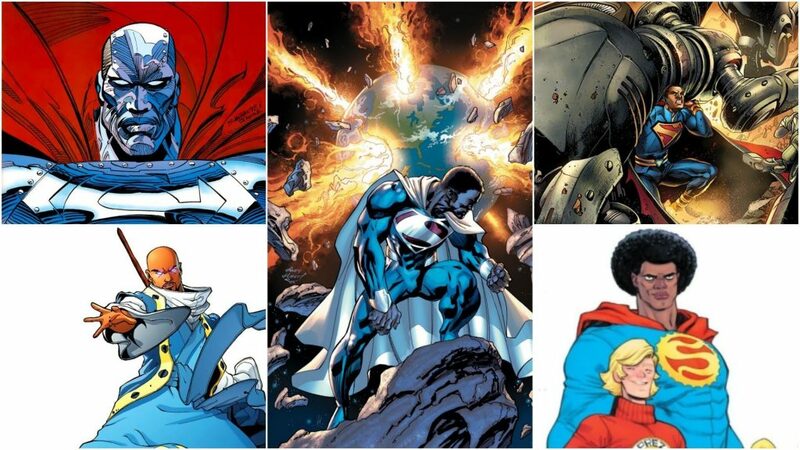 Earth 23 simply being an Earth propagated by Nubian version of DC superheroes. First appearing in Morrison’s acclaimed mini-series, Final Crisis #7 (2009), Calvin is accompanied by his world’s Wonder Woman, named – ironically – “Nubia” in stopping the devastation of all existence from the combined might of Darkseid and the Mad Monitor Mandrakk. When conceptualizing Calvin Ellis, Grant Morrison openly admitted he was inspired by then-President Barak Obama (and boxing legend Muhammad Ali). It is no surprise that in Ellis’ day-job he is the President of the United States (a questionable feat given he is literally an illegal alien). In the few moments he is allowed to shine, Calvin does exhibit the morality and humanity of his real-world inspiration. 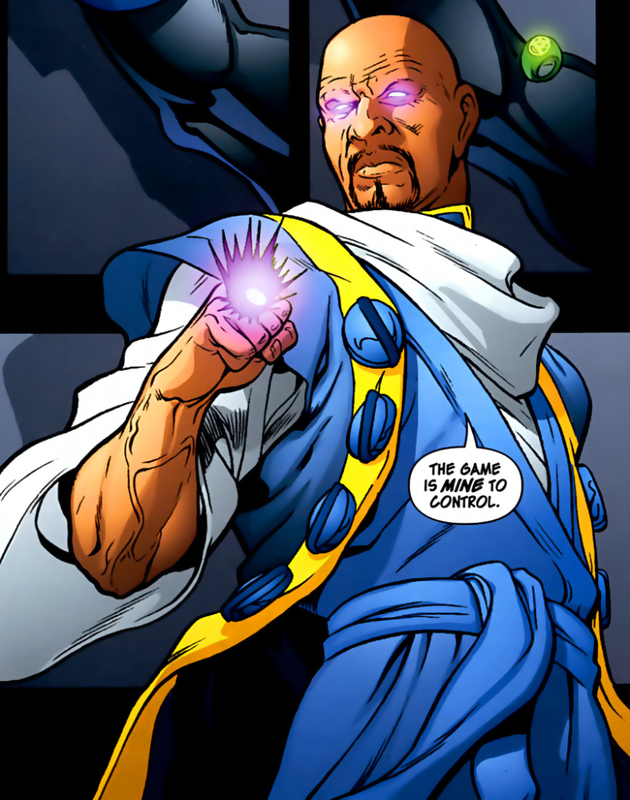 Interestingly, on further examination, Calvin may be a more realized interpretation of the character Icon, a Black “Superman-esque” creation of Nubia-centric writer Dwayne McDuffie and artist M D Bright back in 1993 for the minority-creator-owned Milestone Comics. But with Obama’s administration a long-recalled dream, there may not be a place to see more of Calvin, especially given his designation in the obscure DC multiverse. Another side note is that, theoretically, Calvin may be a reinterpretation of the miscellaneous Nubian Superman of Earth-D (conceptualized by writer Mark Wolfman) who died with his universe during the first Crisis, having only appeared in an appendix story Legends of the DC Universe: Crisis on Infinite Earths – The Untold Story (1999). Harvey Dent/The Super-man of Earth 9. Image credit DC Comics. One of the more unique version of Superman came from Earth 9, known as the “Tangent” universe, from the brief “Tangent Comics” one-shot line of comics from DC published during 1997-1998. The brainchild of Dan Jurgens, the idea was to basically have the most outlandish and divergent interpretations of DC’s established heroes and villains, to the point where they were unrecognizable from their mainstream namesakes. Out of this eerie and radically different world we get Harvey Dent, “The Super-man”. Unlike other, more traditional versions of the Man of Steel, Harvey Dent was a normal, but exceptionally brilliant, human given incredible psychic powers through secret experimentations. These metal powers rival Marvel’s greatest telepaths and telekinetics in both scope and scale. He essentially became the reluctant dictator of Earth by the end of his run. Having undergone personal tragedy and becoming consumed by his Messiah-complex (exemplified by his Biblical “shepherd” motif), this meticulously orchestrated narrative embodied this Superman with a level of unique pathos. While “Tangent Superman” was conceived by famed writer Mark Miller and Jackson Guice, what is most astonishing about this Black version of Superman is that his origin, power set and nefarious ambitions actually mirror the original concept of Jerry and Joe’s proto-Superman story, before scraping that grim idea for what we have come to know as the more heroic and definitive Superman in Action Comics. Furthermore, the tragic trajectory of this Superman and his world share striking similarities with the more realistic and 1930/40s noir-influenced Watchmen universe by eccentric scribe Alan Moore, with Harvey echoing the sentiments of the graphic novel’s iconic, Machiavellian savior/antagonist Ozymandias. Harvey Dent would briefly appear in a crossover with the mainstream DC Earth during Superman’s Reign (2008) mini-series, but beyond that, Earth 9 and its strange, obtuse characters have all but been abandoned, given that this “Elseworld” experimentation had ran its course. Val-Zod/ Superman of Earth 2. Image credit DC Comics. Back in September of 2011, DC decided to unceremoniously restart its entire line of comics under the event famously (or infamously) known as The New 52 (ending in 2016). Nevertheless, we were introduced to the newest Nubian interpretation of Superman, in the form of Val-Zod. A denizen of Earth 2 (or rather Universe 2) which is a reimagining of the classic Golden Age DC heroes and their “Justice Society”, Val-Zod is an agoraphobic Kryptonian kept sheltered from the outside, in a world that had lost its own original Superman, Batman and Wonder Woman. Rescued by a nascent band of superheroes (called “Wonders”), including Superman’s cousin, Supergirl, Val-Zod must reluctantly adopt the mantle of the former Man of Steel (i.e. becoming “Superman 2.0”), while a horrific doppelganger from Apokolips ravages the Earth. The idea of a “reluctant” Superman was ripe for exploration, especially in a real-world context that people have grown despondent over the “Big Blue Boy Scout” and his immaculate sense of morality in a jaded world of grays. Unfortunately, this overly reserved Black Son of Krypton became incapacitated in his internal struggles, losing his agency and relevance as the story of Earth 2 progressed. Sadly, the universe was all but put to rest when the last issue of Earth 2 (Earth 2: Society #22) was published in 2017, although on a hopeful high note. This latest attempt at a Black Superman had potential, but I suppose the writers feared treading similar ground and didn’t know how to fully develop or utilize the uniqueness they had created with Val to a noteworthy degree that his popularity may have transcended the end of his world (like Miles Morales at the death of his “Ultimate”/Earth 6160 universe), rather than be swallowed alongside it. John Henry Irons/ Steel. Image credit DC Comics. 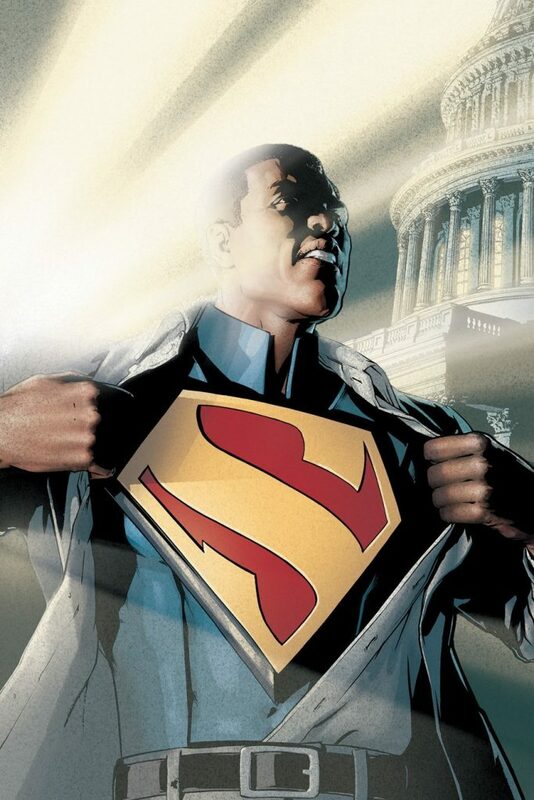 Lastly, the most enduring Black Superman in DC’s history is one that exists in the mainstream universe. A mortal man named John Henry Irons, first appearing in Adventures of Superman #500, his name and physique were inspired by the American folk hero of the same name (John Henry). John himself was inspired to become a superhero by none other than Superman himself, who had saved him one time. When the original Man of Steel died at the hands of Doomsday in the 1993 groundbreaking event of Death of Superman, four imposters/substitutes rose to take his place as Earth’s greatest champion. Possessing no powers himself, John was nevertheless an accomplished metallurgist and engineer. Forging a suit of armor, this “broke Black Tony Stark” became a literal “Man of Steel” fighting gang violence in the inner city of Metropolis, and later Washington DC. A man of the people, John was a very grounded and humble man, haunted by the fact that his genius and inventions were twisted by evil corporations to make weapons that fell into the hands of kids. On face value there wasn’t that much of a difference aesthetically from Marvel’s Iron Man, given John’s secondary motivations and his modus of atonement. 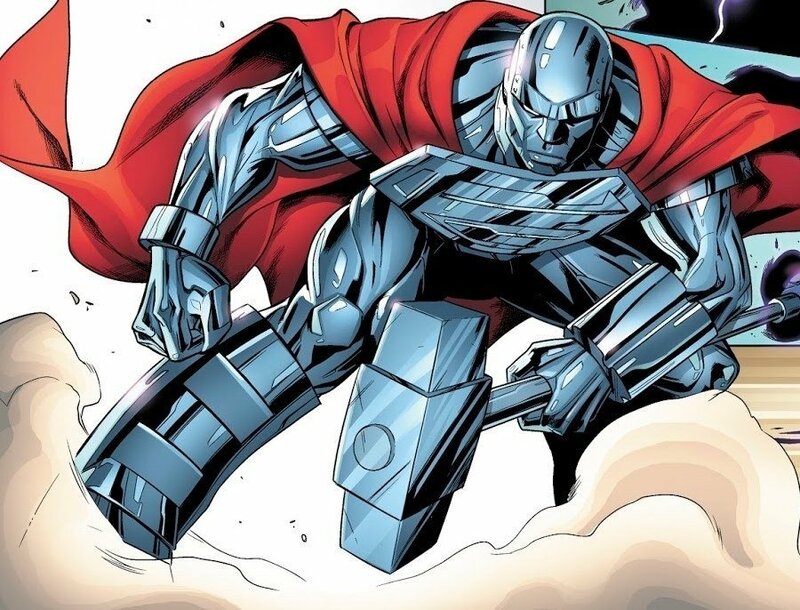 The only unique facet per se was the Superman cape Irons wore (which habitually got shredded) and that he carried a crude sledgehammer (indicative of the folk hero), that later developed into a high-tech hammer not too dissimilar from Thor’s Mjolnir in design. Paradoxically, Steel was created the same year (1993) as Milestone’s own Hardware/Curtis Metcalf (created by Dwayne McDuffie and Denys Cowen); a character virtually identical in powers and backstory. The tangential parallels to Superman are furthered by the introduction of Henry’s niece Natasha Jasmine Irons (created by Louise Simonson, Jon Bogdanove and Chris Batista who premiered in Steel #1 1994), who herself becomes Steel for a time and even her own superhero. Natasha could be seen as Steel’s “Supergirl”, as Superman and Supergirl are blood related cousins (John and Natasha are uncle and niece), and the older male becomes the inspiration for the younger female in pursuing a heroic career. And like Supergirl, Natasha Irons developed into a hero of her own right. Fortunately, she “outlives” her uncle being a current member of DC’s ongoing Titans comic with her own “Steel” suit and massive tech-hammer. Natasha and John Henry Irons of Earth Prime. Image credit DC Comics. When the real Superman returned from the dead (back in 1994), the “imposters” continued to live on, with both Steel and Superboy getting their own comics. Steel ran from 1994 to 1998 for 53 issues, which showed him moving to the US capital and continuing his fight against gangs. 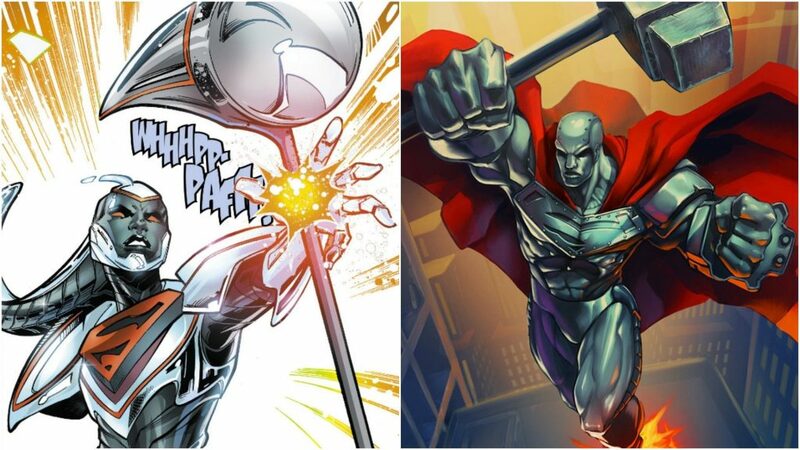 After his comic’s run came to a permanent end, Steel became a tertiary character, appearing in mega events or collaborations with other heroes as a support character, with a few upgraded variations to his suit over the course of his existence. His most noteworthy role since came as a main character of the critically acclaimed year-long 2006 semi-anthology series simply titled 52 – a story that explores a world (for a year) without Superman, Batman or Wonder Woman. In it, John, like his folklore counterpart, is in a seemingly unwinnable battle against Lex Luthor and his devious “Everyman Project”, but through perseverance gains the upper hand in the end. When his character was re-introduced during the New 52 company-wide reboot, little effort was made to flesh him out for a brand new audience or give him a second chance outside of a more Mark-1 revision of his costume. Plagued with sparse appearances, there was an attempt to give him greater relevance when Superwoman (18 issues from 2016-2018) was being published. John became the romantic interest of Lana Lang (aka the titular Superwoman). Lang Lang, for the uninitiated, is Superman’s college sweetheart and an accomplished engineer who gained the powers of Electric Red Superman (for a time)…long story. But as with his own solo title, when Superwoman ended its brief run, so did Irons prominence with it. Growing up, I was there to witness the birth of John Henry Irons, and I was even more thrilled to have a Black man who was, for all intents and purposes, Superman. He was stated to embody the heart and spirit of Superman, even if he did not share the hero’s Kryptonian heritage – it was the man, not the powers than made one worthy of the “S”. I was enthralled by his compelling backstory and struggles (*I did not read Milestone at the time due to availability, nor was I an Iron-Fan). The fact he also shared inspiration from an African-American folk hero was a bit of an overreach as the absurdity of trying to shoehorn the trademark sledgehammer into his character was blatantly obvious and a bit much. But as with Milestone’s line of minority superheroes (save Static), little success was found outside of the niche demographic to justify his permanence in the forefront of the publishing house. Out of all the Black Supermen to have come and gone, I was (and am) most disappointed with the treatment and utilization of John Henry Irons after his debut. I long for his return to form as a prominent DC character. I have deliberately ignored the fact that Steel was the only Black DC character to get his own theatrical movie, in 1997, played by Shaquille O’Neal. And like the horrible 2004’s Catwoman (starring Halley Berry) after it, Steel was a garbage fire that paid little respects to the source material, taking only the minimal, superficial essentials to create an utterly appalling and repulsive adaptation and film. If handled right Steel could have been DC’s Blade. Maybe in another parallel universe. Ultimately, while there have been a few Nubian interpretations (and homages) of Superman, none of them have ever truly achieved the elusive ability to stand from the original as a rightful, if not honorary, suitor to the mantle the same way as Miles Morales (and Gwen Stacey/Spider-Gwen) has done with Spider-man, or Terry McGuinness with Batman. From the utterly divergent Harvey Dent to the pallet-swap Calvin Ellis, none have come close to being an enduring worthwhile alternative. Maybe we don’t need a “Black” Superman, but at the same time, that does not mean we stop trying and looking for one. He, or she, may not bear the name or the unmistakable “S”, but may very well embody what we come to recognize as the purer, more appealing and inspirational aspects of this visitor from another world, who shares not only skin color, but in our exclusive struggles and our hopes to give us something to look up to, to look…up in the sky!